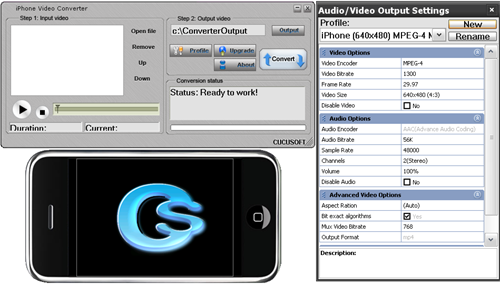 Cucusoft iPhone Video Converter is an amazing and user-friendly iPhone Video conversion software that provides a thorough solution on video file conversion to iPhone format. It can convert most video file formats, including dvr-ms, MPEG, DivX, XviD, MOV, rm, rmvb, WMV, AVI and more to a file format compatible to your device so you can enjoy watching your favorite videos and movies on your iPhone whenever you want. In addition to that, this program can be yours at a very resonable price! Allows "Drag and Drop" input video files. User-friendly and very nice user interface. --Output is comptatible to iPod as well. --Reliable customer support that will always be happy to assist you. You may email your inquiries at support@cucusoft.com. Can support any video file that can be played properly on your computer via Windows Media Player.